The sea wall created a fresh-water habitat in the Laguna Salada and surrounding wetlands which are now home to two species protected under the EPA." Flood the affordable recreational resource and important historic public golf course - Alister MacKenzie's Sharp Park masterpiece. The Coastal Commission decision was made, but San Francisco Rec & Park repair and reinforcing work of the sea wall is yet to begin. The consequences of a breach would be devastating to the community, endangered species, and Pacifica civic fiscal fortunes. To borrow a phrase: Winter is Coming. "11. Resolution supporting the City and County of San Francisco for Sharp Park Golf Course facility berm and maintenance repair and improvements, and incorporating flood mitigation, report, resolution." It should be an easy decision - right? Well, it should've been an easy decision for the Coastal Commission, yet 3 of the 12 Commissioners argued against granting the permit. The Pacifica City Council should send a strong, clear message to San Francisco stessing the importance and urgency of maintaining the berm now. "Since the mid-1970's I have owned a home in Pacifica's West Sharp Park neighborhood. I live west of the Coast Highway, south of City Hall, and a block and a north of the golf course. When the Sharp Park levee wall breached in 1983, you could paddle a kayak to the foot of my street. Linda Mar flooded too that year. References are made to the sea wall, but to Pacifica locals it's the Sharp Park levee. With this in mind, on Nov. 8 I drove to Bodega Bay with a friend who lives in Fairway Park, to testify at the California Coastal Commission's hearing on San Francisco's application for a permit to maintain, repair, and add trail improvements to the Sharp Park levee. 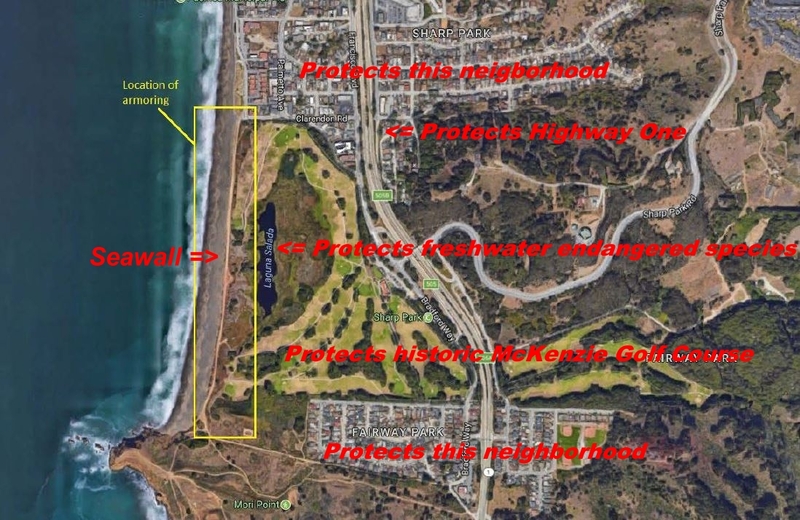 As homeowners we spoke in favor of keeping the levee -- in addition to protecting our neighborhoods, it also protects the golf and its wetlands and frogs and snakes, and serves the Coastal Trail between the Pacifica Pier and Mori Point. It's all good." In my humble opinion, this permit approval was even more important for Sharp Park than the SF Board of Supervisors Natural Resource Plan approval last spring. At the hearing for the resulting permit approval commissioners learned why any notion of "managed retreat" permitting the erosion of the berm/seawall is unrealistic, would invite catastrophic devastation and is simply not feasible. This was confirmed by Coastal Commission District Director Dan Carl as noted in the Pacifica Tribune article at the top of the page (100% probability of the neighborhoods flooding without the sea wall), as well reports by the staff of San Francisco Recreation and Park Department who are responsible for maintaining the Sea Wall. "Managed retreat was one of the alternatives that was looked at under the six alternatives that we provided in the analysis to the Coastal Commission. And we found managed retreat at this time to be infeasible for several reasons – both the cost it would take to move the golf course and the habitat and the amenities and I mean even the residential areas that might be at risk – inland, would be enormous. Additionally, as discussed earlier, moving the endangered species habitat raises a variety of issues related to whether you can even do that... "
Net.. net ... This was an extremely positive outcome. 30+ years of screwed up permitting for the sea wall by the City of San Francisco was cleared away in a stroke. A solid pragmatic vote by the Coastal Commission confirmed that San Francisco must continue to maintain and improve the existing sea wall to protect the course, habitat, and neighborhoods. The common sense decision to maintain the seawall is set for the foreseeable future. We just need the work to get done sooner rather than later. That November 8 Coastal Commission hearing was great local political drama, and a video can be viewed at Cal Span [LINK HERE]. The Sharp Park Hearing is Agenda Item No. 9 (CDP 2-17-0702), starting at 1:01:05 and lasts about 90 minutes. Commission Chair Bochco’s exchange with Director Carl can be found at 2:27:25 – 2:28:49). Someday I may edit a few clips to post here. Someday. 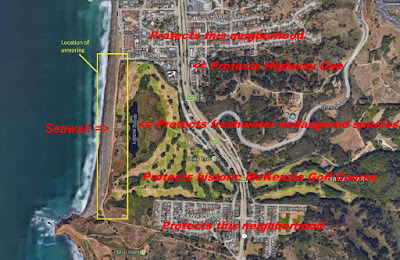 The entire video is about 15 minutes and features the issues highlighted in this post: Commissioner Bochco saying she opposes sea walls in general, but supports a sea wall like Sharp Park protecting habitat and structures; SF RecPark's Potter stating the sea wall is necessary to protect the endangered species habitat, discussing the staff analysis of alternatives like "managed retreat" and finding it insane (my words not his - he used "infeasible"); Commissioner and progressive SF Supervisor Peskin stating that we cannot ignore the existing assets protected by the Sharp Park seawall; Commissioner Groome outlining the cultural and fiscal importance of the golf course and park to the city of Pacifica; Residents of Sharp Park and Fairway Park pleading for protection of their neighborhoods. The City of Pacifica will be on the record with a letter to leadership in the City of San Francisco expressing the need and urgency to begin work on long deferred Sharp Park sea wall maintenance before the winter storms. Common sense and rational practicality carried the day by a narrow 3-2 vote. But... Pacificans - you still have two votes that just don't have any concern or see any urgency about the possibility of winter storms breaching the Sharp Park sea wall. So there's that.